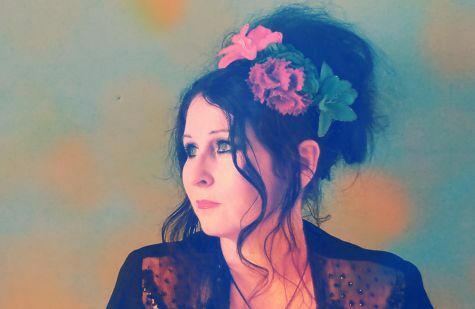 Louise Trehy, formerly of 1990s dream-pop duo Swallow, recounts her foray back to the music world and her fantastic new album. Hello Louise! I’m so thrilled to have this opportunity to touch base with you about your return to the music sphere as part of the band Strata Florida. You and Mike Mason made your mark in the 1990s as the duo Swallow, signing to 4AD records and releasing the one-album-wonder “Blow”, as well as a remixes album, “Blowback”, before calling it a day. From what I’ve read, you soon exited the music scene and relocated from London to Wales. Why did you need this geographical distance from London/England? Do you have a connection to the Welsh countryside where you reside? At the time, I felt I had no place in music, I couldn’t relate to the British music scene then and I had lost my musical partner who (I thought) I was dependant on to generate ideas. I love wild remote landscapes and the opportunity came to move to Wales when I got married. When living in Wales, you joined an alternative choir and also learned how to play electric guitar. If I may ask, what is an ‘alternative’ choir? Is that an alternative to a church choir or a choir that only sings alternative music (LOL)? They sing original music written by the choir leader; although in the other sense of the word - many of them indeed had alternative lifestyles - living in Gypsy caravans and the like. They were a pretty diverse group aging in range from 19 to 60; many were in bands and music groups of varying styles. For me it was extremely healthy to re-engage with music through people who did music for the sheer joy of it, and it exposed me to other styles of music. Your new album “Made Of Stars” is spectacular – at once captivatingly timeless and evocative of a particular era that is near and dear to my heart (and my ears!). That ‘era’ would be the 1990s, in the U.K., when dream-pop ruled the…well, maybe not the world, but the discerning listener who was attuned to wall-of-sound guitar distortion, dreamy, layered sonic textures, and hazy, ethereal vocals. Your new album “Made Of Stars” is of this mold, but it also feels bolder and more direct somehow. Can you divulge a bit of detail about how this album came to be? I started writing songs shortly after I joined the choir. Initially I thought I could write some choral pieces that some of the girls from the choir could sing. However, soon they developed beyond vocal pieces when I added guitar to them. After about three or four songs, I knew there was a consistent theme to them which in some ways did reference my work with Swallow that I wanted to develop further. I started experimenting with guitar effects mainly to cover up my inexperience and really enjoyed this –so this became the basic sound. At this point I thought it would be a good idea to work with other people as I was keen to record them as I like developing music through process (and mistakes!) and I lacked musicianship. What was the impetus for you to pick up the guitar, especially an electric and not an acoustic guitar? It didn’t even occur to me to pick up an acoustic guitar! I just love the sound of electric guitars and found acoustic guitar to be a bit too twee for the sound I wanted. In essence it sounds like you’ve never really left music altogether. Did you actually have a ‘break’ from music when you moved to Wales, or is playing/creating music ever-present in your life? Oh no, I absolutely did abandon music. I didn’t go to gigs, buy music or even listen to it at home. Of course I heard music mainly from what my children listened to, but I didn’t actively consume any. This wasn’t a conscious decision, it just happened that way! How instrumental has it been to meet and team up with Peter Pavli regarding the formation of Strata Florida? When you decided to form the band with him, and drummer Steve Kent, were you at a point in your life where you knew you had to be in band and create an album? I met Pavli (he just calls himself by his surname) through the choir. I heard rumours he had played with Bowie, so I was curious about him. I saw him perform a couple of times in one of the choir member’s bands and he interested me as a performer as he kept his back to the audience. He liked my demos which were crude and unfinished but still interesting to him. I think what I liked most about him was that he didn’t try and make me play guitar in a conventional way as he thought the sound I got from it was good. He was very strict on tunings and timings though! Once the basic sound was in place, it left room for both of us to experiment - him with lead guitar and bass and me with vocal effect and harmonies. Crucially, I think this is what I felt had gone wrong with Swallow in the studio, the basic sound had gotten lost in production and everything else took over instead of complementing what was there. We wanted live drums, so we asked Steve who we also knew through the choir to play on some songs. From what I’ve read elsewhere, you’ve mentioned your “odd major minor guitar tunings”, which I think existed from your days into Swallow and which create an intriguing effect to your songs. How did you hit upon this type of guitar sound? Are you playing guitar on “Made Of Stars” or is that all Peter’s playing? Mike in Swallow used E tunings, I started off using an E tuning (on “Lost in the Shadows”) but at an early point a string slipped and I really liked the sound and wrote “Hang On” so from there I started experimenting with tunings. I can only play bar chords, Pavli plays lead and bass, and rhythm guitar when I can’t stay in time and he gets annoyed with me! Speaking of guitar sounds, I’m a sucker for the winding aero-guitar line on the song “Monster” and the wind-swept, scouring guitar sonics of “Lost In The Shadows”. What kind of settings or types of guitars were used for those songs? All the guitar parts are from a Squire Stratocaster, on alternative tunings put through effects. I think “Lost in the Shadows” has a phaser with delay. The tunes on “Made Of Stars” are richly textured to the point where it’s hard to suss out exactly what instruments are being used at times! What other instruments were employed in the creation of the album? We used some synth strings on “Automatic” and at the beginning of “Lost in the Shadows”, some synth choir on “Made of Stars”, and the rest does all come from the Strat - though I do a lot of processing through Cubase plug-in effects. Are there actual horns playing on "Lost In The Shadows"?! No! It’s guitar through a cheap guitar effect box. Your vocals are so sweetly and wistfully sky-high airy and enchanting. At what point in your life did you realize that this upper register is where you could and wanted to sing at? It just turned out that way, though I was lower soprano in the choir and they made me work really hard, so I think the practice there was good for me vocally. 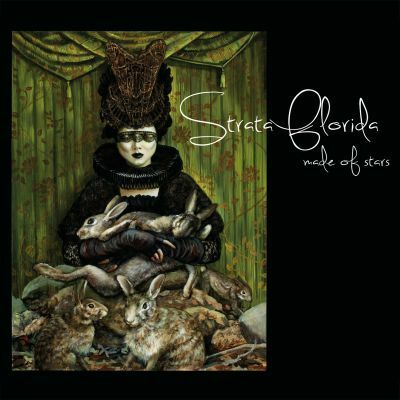 The “Made Of Stars” album artwork is pretty wild! Who designed the cover and what does everything represent? It’s difficult in the main to make out your lyrics – except for the chorus of “Sleep” – or maybe my ears are getting too old… Do you feel that vocals should be part of the overall sound, i.e., as another instrument? Or do you feel that the lyrics are important too? I like the sound of the guitars and bass pushed forward and the vocals and drums pushed back, it’s just the sound I like. I’ve just put the lyrics on our website, I don’t know if this is a good thing though, as lyrics aren’t like poetry and are meant to be sung not read. I just read your lyrics rundown at the official Strata Florida site. Your words and thoughts are so perceptive and trenchant, especially about relationships that don't quite go right... It seems like you're in a good state now, and I love the uplifting lyrics of "Hang On", with the phrases "hang on to yourself" and "Go out, fight for it / live for your dreams". Did you write most of your lyrics while you were in a tumultuous relationship or after it ended? Yes, the songs were written during the end of my marriage although they are not just about that relationship. I realised during the process that I was writing about all my failed relationships and how I kept ending up in unhealthy situations, so I was reflecting on this while realising I had to stop repeating this type of self-destructive behaviour! I had been scared to leave relationships in the past because of loneliness or insecurity, but I actually found the opposite to be true. After that break up was a period of the most content, creative, self-fulfilling time I’d ever had. I read on your SoundCloud site that you produced this album yourself and that you enjoyed the creative process, and that you fiddled around with cutting and pasting sounds and even playing your vocals backwards on certain tracks. Can that be heard on the final album? Yes, that’s exactly how it is, the singing backwards bit is that I would sing something, reverse it, sing it as it sounded reversed and then put that forward again. How are the next few months shaping up for you? Will you be touring or making any videos? We have no plans to tour as I am keen to get back to writing and recording which is what I enjoy most. I am keen to develop what I have learned from recording “Made of Stars” and also have Pavli more involved with song writing. My introduction to you was the dreamily reflective Swallow song “Oceans and Blue Skies”, which I recorded to tape from college radio! Yes, a long time ago… Looking back, hopefully mostly fondly, at the 1990s, what are your favorite memories from that time period? The early 90s when I moved to London and was going to gigs every week was very exciting and a lot of fun. The music scene was really interesting; maybe I enjoyed it more before I was in a band. For me, I can honestly say that after writing and recording the demos with Mike for “Blow”, the whole thing was painful. I had a bad time during the recording of “Blow”, then 4AD hated me, then Mike hated me. I’m so sorry to hear about that, Louise! What about your recent favorite memories as Strata Florida? I can honestly say I have enjoyed every minute; I have had some frustrating experiences with equipment, and Pavli and I have had one or two fights! I think when we finished “Hang On”, which took quite a few experiments with sounds, I knew we were working well together. Also when Marc Joy mixed “By the Way” and I knew he understood us and he would help us realise the songs beyond their DIY recording. Christmas Eve when we had finished the whole album was very special as I think I finally proved to myself that I had been wrongly dismissed by Ivo Watts Russell all those years ago as being insignificant in Swallow, and that I wasn’t a bad little songwriter after all.